Ayutthaya, the original “Venice of the East”, has a richly textured past that is impressively chronicled at the Chao Sam Phraya National Museum in that province’s Muang district. Named after the man who became Borommaracha II, the seventh ruler of Ayutthaya, it houses the most extensive collection in the country of artefacts from this great civilisation. Founded in 1350 by King U-Thong, it was to hold sway over much of central Thailand, and beyond, for the next four centuries. Opened to the public in 1961, the museum now displays some 2,400 items, with many more kept in storage because of space constraints. That there are any exhibits at all is a testament to the efforts of the Fine Arts Department and the dedication of a small group of historians and archaeologists. 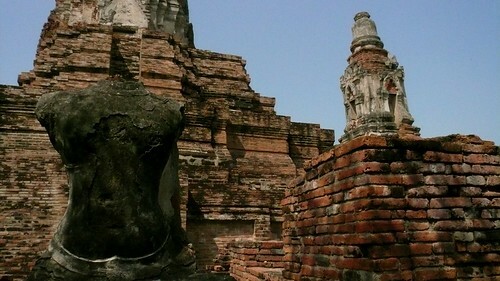 For Ayutthaya, a city built mostly from wood, was methodically looted and then burned to the ground after its capture in 1767 by two armies from the Burmese kingdom of Ava. When the invaders left, taking with them much booty and the surviving population as war captives, little remained except the ruins of the city walls and severely damaged stone temples and statuary. It was one of these temples which, many years later, was to yield up a fabulous hoard of treasure that is today given pride of place in a room of its own at the museum. According to Phongsawadan Luang Prasert, the Luang Prasert Chronicle, it was the aforementioned Borommaracha II who, shortly after accession to the throne in 1424, commissioned the construction of two chedi on the site where his two elder brothers had engaged in single-handed combat on elephant-back to decide the succession, resulting in both being killed. He had his brothers’ ashes placed in the chedi. Later a main prang (rounded, Khmer-style tower), four lesser prang and, to the east, a viharn (chapel) were erected at what was to become known as Wat Ratburana. In late 1957, looters broke into the the main prang and dug down into a two-level crypt beneath it to steal a great quantity of valuable material, most of which has never been recovered. The Fine Arts Department proceeded to excavate the site and found a total of nine rooms containing bronze Buddha images, precious stones and many artefacts made of gold, including royal regalia and miniature utensils. Also discovered were more than 100,000 votive tablets placed neatly one on top of the other, each hoard topped by images of the Buddha from Siam, India, Burma, (what is now) Indonesia and Nepal, plus some Hindu images. Proceeds from the sale of some of these votive tablets were later used to fund the construction of the Chao Sam Phraya National Museum. The spacious main hall there is an elaborate showcase of Buddha images and the remnants of architectural features from different periods. The oldest religious stone images date back to the Dvaravati period (7th and 8th centuries). Among the most striking are an enormous seated Buddha and one in a peaceful meditation pose. An artistically executed bronze Buddha head, recovered from Wat Thammikarat (13th or 14th century), had drawn a huddle of admiring visitors at the time of our visit. On its right are glass cabinets holding more Buddha images excavated at Wat Ratburana and Viharn Phra Mongkhon Bophit. Farther down, towards the right-hand corner, is some of the stuccowork which once decorated Wat Mahathat, thought to be one of the earliest temples in the old city and located opposite Wat Ratburana. Displays along the wall to the left include a large variety of paintings on wood panels from Wat Phra Si Sanphet and part of a garuda statue. In this section of the hall, too, are artefacts dating from the reign of Narai the Great (1656-88), when the kingdom of Ayutthaya was at the pinnacle of its glory. The upper floor houses royal and religious paintings, antique coins, small clay tablets inscribed with sacred Buddhist texts and a terracotta pedestal bearing an image of Mother Earth and disciples of the Buddha. The main attraction on this level is the Ratburana Room and its display of gold ornaments and jewellery unearthed from the crypt of the temple of the same name. These priceless pieces are kept in locked cabinets, watched over by an ever-vigilant attendant. Noi, our tour guide, remarked that people tend to spend a lot of time here, lingering to admire the superb craftsmanship of treasures including necklaces, pendants, a scaled-down model of a famous prang made of embossed gold plate and miniature reproductions of royal regalia. An adjacent room contains more wonders. A bejewelled, golden headdress designed to be worn by a man and a golden sword sheath decorated with various gemstones stood out from the rest of the exhibits. After completing our tour of the museum, a 10-minute drive took us to Wat Ratburana itself. I was excited at the prospect of exploring the place in which the treasures I’d just seen had been found. The main prang, restored to an approximation of its original splendour, is clearly visible as you approach from the east. We climbed to the top of a steep flight of stairs leading into the towering structure, then down a narrow, shaft-like staircase (built by the Department of Fine Arts in the late 1950s) to reach two unrestored chambers with original paintings still visible on the walls. The light was dim and the images faded but I could make out representations of what were obviously meant to be people. A great number of objects, made of gold and obviously intended for use by individuals of high rank, were discovered in both rooms. The finds included miniature gold utensils and the statue of a deity holding a sword, but the most talked-about object was a crouching gold elephant in full ceremonial livery holding flowers in its tusk. Today all that remains of the original of what was, in all likelihood, a memorial to those two princely brothers is a succession of tiny, empty rooms and, outside, dotted around the temple compound, a succession of charred, decapitated or otherwise vandalised Buddha statues. Feeling a little let down, we moved on to visit the Portuguese and Japanese quarters of the old capital. Separated by the Chao Phraya, these are located virtually opposite each other. On the site of the Japanese district, swords, earthenware jars and other donated artefacts are stored in a newly built exhibition hall overlooking the river. An effort has been made to chronicle the history of early trade relations between Siam and Japan with documentaries and computer graphics. Outside, a huge stone tablet bears an inscription in Japanese. Strangely, no Thai or English translation is provided. A member of staff kindly did the honours; the text reads: “A memorial to the Japanese settlement in Ayutthaya”. The Japanese settlement is thought to have extended along the river for about a kilometre (from where the main road now crosses it) and inland for about half that distance. A 3-D scale model in a souvenir shop within the compound shows neat rows of wooden houses surrounded by canals on three sides. We concluded our journey at the Portuguese quarter. A cemetery and the ruins of a Catholic church are all that are left standing. Credited with introducing the cannon to this part of the world, the first Portuguese who reached Ayutthaya were seafaring adventurers; they were followed by merchants, mercenary soldiers and missionaries from the Franciscan, Dominican and Jesuit orders. It is estimated that during King Narai’s reign the population of this section of the city reached 3,000 souls, many the progeny of mixed marriages. By that stage, however, the Portuguese “star” was in decline, as the French, Dutch and English grew in number and influence. The only evidence of the latter’s presence to survive, however, are accounts written by some of these expats on their return home. After Narai’s death in 1688, his successor, King Phetracha, expelled most European nationals from the kingdom. Given the bewildering range of possibilities, a day-trip to old Ayutthaya is only sufficient to scratch the surface of this city’s multi-layered past. If you have a little more time to spare for a thorough exploration, do some research to pinpoint the more interesting destinations (this also helps you avoid “temple fatigue”) and schedule outdoor excursions for the cool of the early morning. – By rail: Trains leave from Bangkok’s Hua Lamphong Station on Rama IV Road (phone 02-223-7010 or 02-223-7020) every hour between 6:40am and 10pm. – By bus: Air-conditioned buses leave Bangkok every half hour from the Northern Bus Terminal on Phahon Yothin Road (phone 02-537-8055/6) between 5:30am and 7:20pm. Non air-con buses (phone 02-725-7615 ext 117) depart Bangkok for Bang Pa-in, Bang Sai and Ayutthaya at short intervals throughout the day between 5:30am and 7:20pm. – By car: Take Highway No. 1 (Phahon Yothin) out of Bangkok, then get onto Highway No. 32 which will take you all the way to Ayutthaya. Alternatively, take either Highway No. 304 (Chaeng-Wattana Road) or Highway No. 302 (Ngamwongwan Road) out of the city, turn right onto Highway No. 306 (Tiwanon Road), then take Highway No. 3111 (Pathum Thani-Samkhok- Sena) and turn right when you reach Sena district onto Highway No. 3263.